YouTube8 is a free Windows 8 YouTube app that lets you watch YouTube videos directly from you desktop, provided you have a broadband connection. 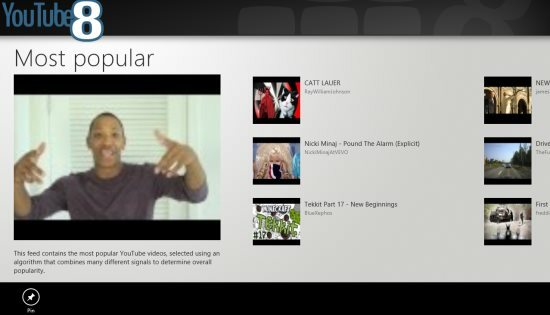 Now, as you open the Windows 8 app, you will be displayed with videos in abundance under different categories such as “Most Viewed”, “Most Popular”, “Most shared”, “Most Discussed”, “Most Responded”, “Top Rated”, “Trending Videos”, and so on… As you click on one video under any category, it will bring you a page where you can watch the selected video with its details including Title, Published, Author, Category, Rating, and the like. By default, the video will be played in a small screen mode. If you want to watch it in full screen mode, just click on the “Full Screen” icon given at the bottom right side of the video. Also, if you want to expand the number of videos according to the category, just click on the category name given on the home page. As you scroll on the right side, you will be displayed with more such videos, and at the end of the page you will be given a “More” option. Click on that “More” option to view more videos. In addition, you can also “Pin” a video to open it directly without going through the entire searching procedure. To “Pin” a video, click on one category. For example: Suppose you have clicked on “Most Popular” category. You will be soon displaed with many more videos under same category. Choose a video that you want to “Pin”. Right click on the chosen video, you will be soon displayed with an “Pin” option. Click on “Pin” to pin that video. So far so good…but but but, one thing I did not find while playing around with this Windows 8 YouTube app and that is it does not have a “Search Bar”, like the original YouTube, which actually limits you with watching the number of videos. In short, YouTube8 Windows 8 YouTube app is a nice app for Windows 8 where you can watch all types of YouTube videos without logon to the website.